Data with a geographic component, geospatial data, is integral to hydrology, meteorology, and many other scientific fields. 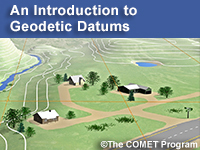 COMET has been addressing geospatial related topics for several years through our publications on hydrography (see our distance learning course, Elements of Hydrography), navigation (see the lesson, Principles of Celestial Navigation), and recently a series of short videos on geodetic datums (see our YouTube playlist, An Introduction to Geodetic Datums). Our collection of lessons in this topic area has grown to the point where we've identified it as its own topic area: Geospatial.